When it was published in 1994, Roger Schwarz's The SkilledFacilitator earned widespread critical acclaim and became alandmark in the field. The book is a classic work for consultants,facilitators, managers, leaders, trainers, and coaches--anyonewhose role is to facilitate and guide groups toward realizing theircreative and problem-solving potential. This thoroughly revisededition provides the essential materials for anyone that workswithin the field of facilitation and includes simple but effectiveground rules for group interaction. Filled with illustrativeexamples, the book contains proven techniques for starting meetingson the right foot and ending them positively and decisively. Thisimportant resource also offers practical methods for handlingemotions when they arise in a group and offers a diagnosticapproach for identifying and solving problems that can underminethe group process. ROGER SCHWARZ is an organizational psychologist and founder and president of Roger Schwarz & Associates, Inc., a consulting group that helps organizations use facilitative skills to create fundamental change. He facilitates groups and teaches, consults, coaches, and speaks on facilitation, facilitative leadership, and developing effective work groups. Schwarz is currently working on The Skilled Facilitator Fieldbook, to be published by Jossey-Bass. To learn more about Roger Schwarz & Associates, visit www.schwarzassociates.com. PART ONE: HOW FACILITATION HELPS GROUPS. 1. The Skilled Facilitator Approach. 2. What Makes Work Groups Effective? 3. The Facilitator and Other Facilitative Roles. PART TWO: DIAGNOSING BEHAVIOR IN GROUPS. 4. Understanding the Theories That Guide Our Actions. 5. Ground Rules for Effective Groups. 6. Diagnosing Behaviors That Enhance or Hinder GroupEffectiveness. PART THREE: INTERVENING IN GROUPS. 7. Deciding Whether, How, and Why to Intervene. 9. Using the Ground Rules to Intervene. 10. Using the Skilled Facilitator Approach with OtherProcesses. 11. Beginning and Ending Meetings. PART FOUR: AGREEING TO WORK TOGETHER. 13. Contracting: Deciding Whether and How to Work Together. 14. Working with Another Facilitator. PART FIVE: USING FACILITATIVE SKILLS IN YOUR OWNORGANIZATION. 15. Serving as Facilitator in Your Own Organization. Resource A: Current and Previous Ground Rules. Resource B: Sample Planning Meeting Letter. Resource C: Guidelines for Developing an Effective Contract. Resource D: Sample Agreement for Basic Facilitation. Resource E: Sample Agreement for Developmental Facilitation. Resource F: Guidelines for Using Experiential Exercises andSelf-Knowledge Instruments. Resource G: Questions for Cofacilitators. Resource H: Guidelines for Contracting with Your Manager. Roger Schwarz & Associates Roger Schwarz & Associates provides facilitation training, consultation, and facilitation to help groups, organizations, and communities create fundamental change. 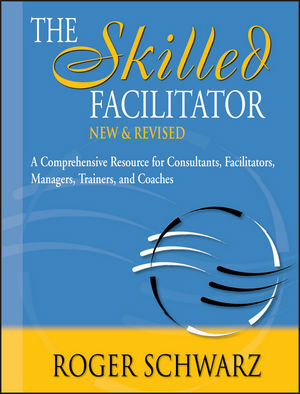 In all of these, The Skilled Facilitator Approach, as detailed in the book listed above, is used. Learn more about this approach at the Roger Schwarz & Associates site. Sign Up For A Facilitation Teleclass Sign up for a free facilitation teleclass offered monthly called: The Skilled Facilitator Approach: a Proven Way to Help Groups Achieve Results They Didn't Think Possible. Get expert advice from Roger Schwarz, author of The Skilled Facilitator. Schwarz will teach you how to get great results in your groupswhile fostering stronger, more satisfying working relationships.